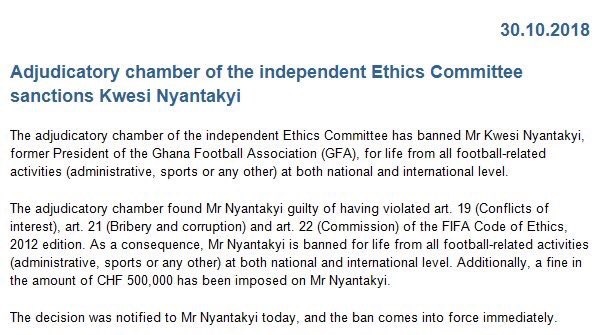 World football’s governing body Fifa has banned former Ghana Football Association president Kwesi Nyantakyi for life from all football-related activities following the revelations of the “Number12” exposé. The Ex-CAF Vice President has also been slapped with a $500,000 fine for several breaches of ethics, according to FIFA. First screened on June 6, the investigative documentary was produced by renowned undercover Ghanaian journalist Anas Aremeyaw Anas and his Tiger Eye Private Investigations Team.